Seventeen Emporia High School students have received awards for 23 pieces of artwork submitted to the Scholastic Art Awards program. Their work will be included in the exhibit at the Wichita Center for the Arts Feb. 6 – March 8. 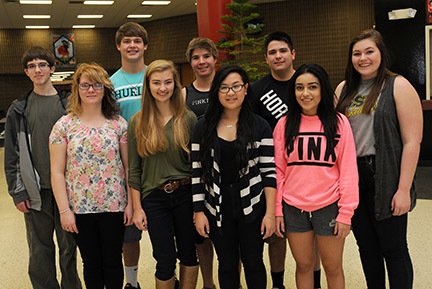 EHS students received two Gold Key Awards, 5 Silver Key Awards, and 16 Honorable Mention Awards. Gold Key Award work is automatically entered into the national judging. An open house is scheduled from 1 – 5 p.m. March 7 for Silver Key and Honorable Mention Award Winners. The Gold Key Awards Ceremony will be held March 8 at 2 p.m. Gallery hours are 1 – 5 p.m. Tuesday – Sunday and admissions is free. The students are enrolled in courses taught by Josh Pavlik, David Mai, Grant Charpentier and Jan Spade.